In a soldier's life, it is inevitable that many sins are committed, which can weigh heavily on the conscience. The rank and file, as well as the nobility, can earn redemption for their sins by joining a crusade, and these men are eager for the opportunity. Give them a chance, and they will defend your army from God's foes. 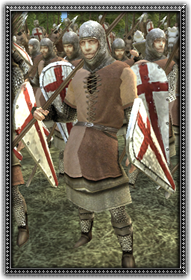 Wearing mail, and wielding a long spear, these are excellent defensive infantry.